This little bunny was a delight to make. It took almost no time and I got to play around with a new (to me) product — DAS Modeling Clay. You can use my pattern by clicking the button below. Or you can make your own. With a project like this one, simple is best. If you’d like to use a wooden base for you bunny, like I did, you can find them at your local DIY store. They’re called “bun feet,” and are normally used under chairs and couches. They come in several different shapes, so choose the one you like best. The pattern has two different sizes. Print them both on copy paper, and hold them up to your wooden base. Choose the size pattern that looks best. Add crumpled foil to the cardboard pattern, with hot glue. When you have the shapes the way you want them, cover the foil with masking tape. The DAS clay won’t stick to foil. Shape the face by pushing in hard on each side with your thumbs to create an indentation for the eyes. Use a tool, like the back of a knife, to push indentations for the bottom of the nose and for the vertical line below the nose. Add a strip of foil around the edges of the ears, and tape them to the head. 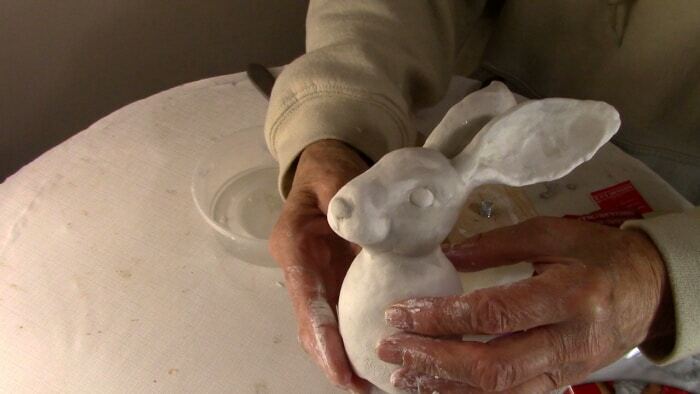 Set the bunny back on the base and twist it around to force the bolt into the bottom of the rabbit armature. 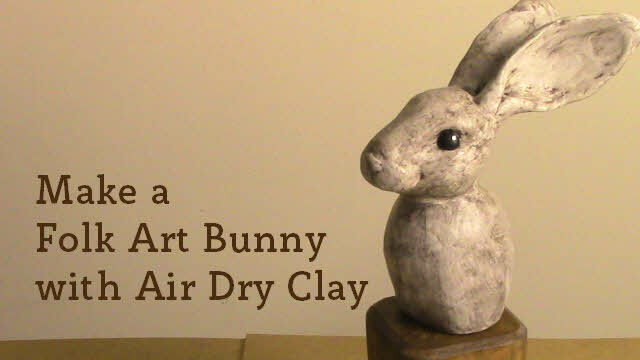 Add a very thin layer of DAS air dry clay to the base and about an inch of the lower portion of the bunny’s body. Make it smooth by dipping your thumbs into a dish of water, and then pressing your thumbs into the clay. Press the bottom of the bunny into the top of the base, to make sure it’s flat, and to make sure the hole for the bolt is still big enough. Then put the base aside. 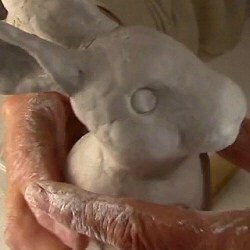 Cover the rest of the rabbit with the clay, making the layer as thin as possible. Use your fingers to make it as smooth as possible. You can also us the side of a knife dipped in water to smooth the clay and to make clear indentations for the nose. Use a cap from a ball-point pen to make a round mark for the eyes. Set the rabbit aside to dry overnight. If you’re in a real hurry, you can put him in a convection oven with the fan turned on and the temperature on the lowest setting. You don’t want to bake the bunny – you just want to dry it out. When the first layer is dry, go back and add details. 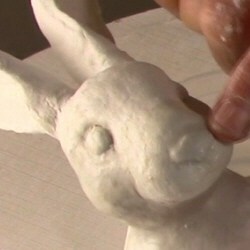 Add small balls of clay to the eyes, and fix any finger marks or scratches that show up on the ‘skin’ of the bunny. Add another small ball of clay to round out the nose. The sculpting part of the project is now finished. Set it aside for another night to dry completely. 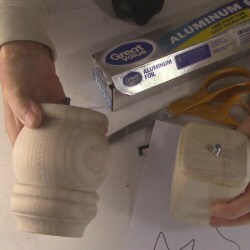 Use a thin mixture of acrylic paint and water to make a dark stain for the wooden base. Paint the bunny with a very light grey. Allow the paint on the bunny to dry. 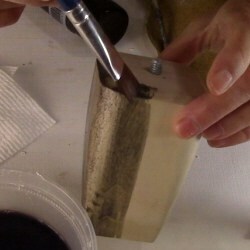 Mix Golden Glazing Liquid with dark acrylic paint (Burnt Umber with a tiny amount of Ultramarine Blue). Brush this mixture over a small section of the bunny. Immediately wipe off most of the glaze with a paper towel. 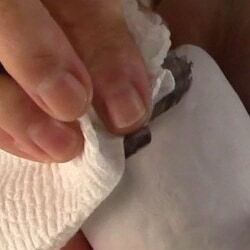 If a dry towel doesn’t remove as much of the glaze as you would like, use a damp towel. Paint the eyes black. When the black paint is dry, add a tiny spot of white paint for a reflection. This will make the bunny seem to come alive. 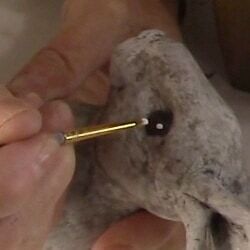 Use a hot glue gun to attach the bunny to the base. Then seal both the base and the sculpture at least one coat of acrylic varnish. I really like the Soft Touch varnish by DecoArt, but any brand will work. 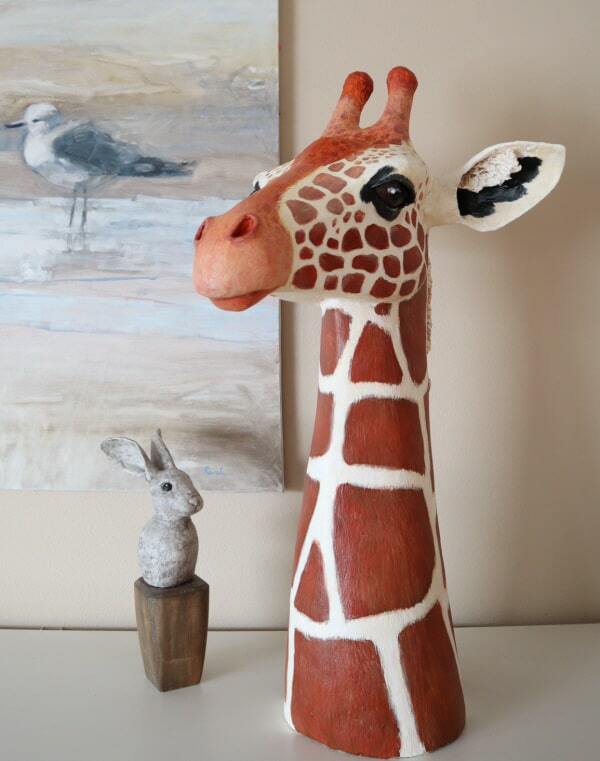 Here’s my finished Folk Art Bunny hanging out with his friend the giraffe. Thank you for the tutorial and pattern! Nowhere near perfect but reflects my lack of experience. Kelly, we would love to see your bunny. Did you try to upload a photo? If you did, it was probably too big for our system. Most cameras save photos in really big file sizes, and my little blog can’t handle them. If you don’t have image editing software that can make your images less than 250 kb, you can use this free online tool. And we do hope you try again! You are truly remarkable! So much talent & you’re willing to share your techniques & recipes! I learned a lot from this bunny video even though I’ve used your recipe before now. What am I doing wrong that I can’t seem to get the consistency right for detailed sculpting? Any suggestions would be greatly appreciated. Again, you are an inspiration! Thank you for sharing! Hi Priscilla. 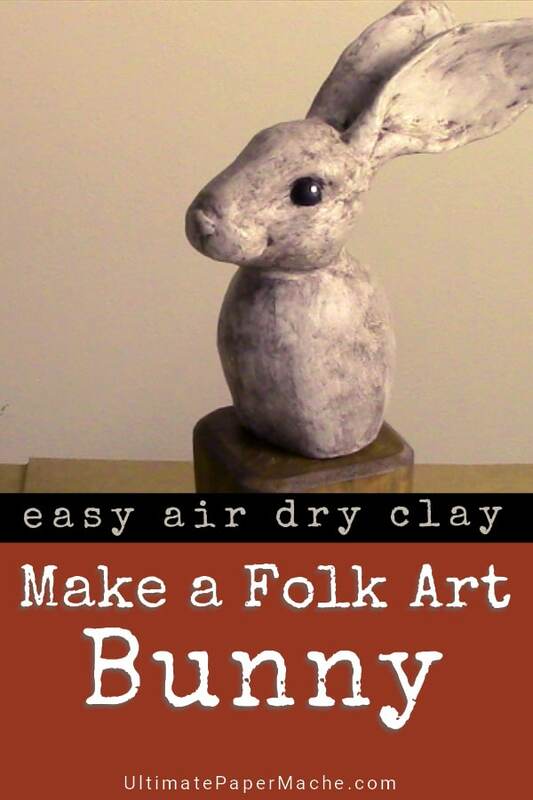 Are you using the air dry clay recipe, or the original paper mache clay? The air dry clay can be modified with more or less corn starch to get the consistency you want. Or use more or less flour – try both and see which one works best. With the original paper mache clay, the extra paper can be more difficult to break up, so it needs lots of time with the mixer. You can also change the amount of flour to make it thicker. And one other option – if you have a hobby store nearby and if you do need to start over, you could use three or four layers of plaster cloth to make your form. It will harden in an hour or so. Once it’s taken off the original and put back together you could put paper mache clay over it to make it smoother and harder. The clay would dry twice as fast because it would be open to the air on the inside as well as the outside. Hi Kathy. I’m so glad enjoying your experience with sculpting and that you’re sharing the ‘secret’ of using patterns inside sculptures. Do you have any photos of your pig or elephant that you could share? We’d love to see them. Hi Jonni, what a sweet little rabbit! Your sculptures always have such personality. I love your choice of base…that’s the way to think outside of the box! I finally found someone to make my bases. He is this expert wood worker that does wood turnings usually but is great for bases and has no issue in coming up with what I want. He also barely charges anything for his service! ( I usually will give him more than what he asks because I am so delighted!) I found him selling his stuff at local craft fairs. I do have a question about the DAS clay. Is it waterproof? I have never heard of it. 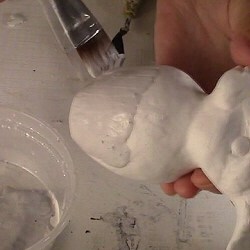 The DAS modeling clay is water-based. I’m sure it will soften if it gets wet again. It isn’t “real” clay, of course, but anything that’s water-based and hardens when it dries (as opposed to a chemical reaction like plaster or epoxy) is bound to get soft again when it gets wet. But it’s still fun to play with. When wet it’s stiffer than I usually make my own air dry clay recipe, which would make it easy to get fine details. I could make my own recipe stiffer by adding more flour or corn starch, but then it doesn’t easily stick to itself. But DAS isn’t ‘perfect’ either – I do wish it wasn’t quite so soft after it dries, but it is easier to sand. As long as you’re really, really careful! Hi Jonni, I was reading your post about your little rabbit and I thought “I can do that” so I am going to try one or maybe even two or three. I have lots of wooden pieces to use for bases. I even have candlesticks that I was going to use for doll bases, but now I could maybe perch a little bunny on them. I still haven’t accomplished much other than some digital art, but I keep hoping one of the days! As for Das clay I had some for years and by the time I went to use it, it was hard as a rock and I had to soak it for days before I could use any of it. My fault, of course but I don’t recall it ever being that great. I still visit your site every day and enjoy it so much. Today my favourite post was the big bottomed ladies . Happy belated birthday, Joyce! I hope we get to see those bunnies when they’re done. Would you like to share some of your digital paintings, too? Hi Anne Marie. It sounds like you were using a computer with a security setting that won’t allow PDF downloads. Do you have access to a private computer? I can have the links sent to your email address again, but if you can’t access the email from a computer that allows PDFs, I’m afraid it won’t help. If you don’t have access to another computer, let me know and I’ll have your purchase price refunded. Also, I just checked my sales records, and I don’t see your email listed. Did you use a different email address than the one you used to post a comment on the blog? Thanks Jonnie I’ve made almost all your animals,horse fish dachshund pig, etc.Your books are great and easy to follow. Do you ever make primitive animals? Hi Pat. I haven’t done that, but I’d like to see some samples of what you had in mind. Do you have a favorite artist who’s website you’d like to share?